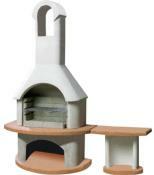 The Buschbeck Carmen barbecue fireplace with side table is ideal if you need extra workspace or beer space. This design will conjure up a holiday atmosphere in any garden setting. The natural grey in the main body of the barbecue is nicely complimented by the attractive terracotta base and mantle piece. Colour: Natural grey and terracotta. Because of the additional weight of the side table on the delivery pallet this means that the inner double skinned hood has had to be removed from the specification. So this barbecue is only suitable for burning charcoal. 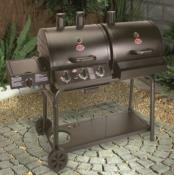 Heavy duty chrome cooking grill is included. 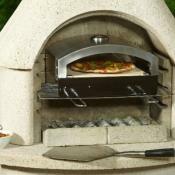 Cast iron cooking grills are available to purchase and can found in the masonry BBQ accessory section. 3 Adjustable cooking heights to help yo control your grilling. Buschbeck being the only brand of masonry barbecue to achieve the very stringent German TUV/GS safety standard, your Buschbeck Carmen barbecue with side table will last for many years to come.